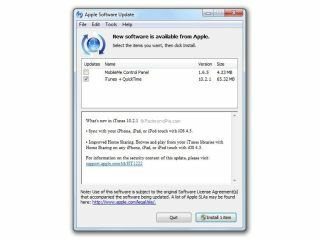 Apple has released an iTunes update in readiness for the iOS 4.3 update. The latest iTunes version is 10.2.1, and includes iOS 4.3 compatibility. Sadly the iOS 4.3 update didn't hit yesterday evening, yet already rumours that it will be released today instead are circling. Perhaps – just perhaps – Apple is sticking to its original release date of 11 March, two whole days away. Today's iTunes update doesn't offer much more than Sync and Home Sharing support which you won't be able to make use of until you have iOS 4.3 safely installed on your iPad or iPhone. If you're determined to get iOS 4.3 the moment it hits iTunes, it's worth updating your software now. That way you won't have to sit through the slowed-down update when the rest of the world is feverishly trying to do the same thing.